I paid to have both of the quilts I’ve pieced so far quilted for a variety of reasons: my domestic sewing machine is old , I didn’t want to bunch up the quilt under the arm, I was afraid I would ruin my patchwork by sewing crooked quilting lines, having someone else help was too inexpensive to pass up and a time-saver… But I wanted to take a new level of ownership with my sampler quilt. I wanted to do the piecing and the quilting. Plus, I wanted to highlight the shapes of some of the blocks with the quilting, and I thought it might seem lazy if I had someone else do it within such specific parameters. So I needed to learn about quilting. Somewhere on Pinterest in the last year, I found an article that said rows of quilting should be 4-6″ apart. I am planning to use this quilt-as-you-go method with my sampler quilt, and I figured the 6″ guideline would be close to what I was planning. Some squares might be a little farther apart, some closer. Could it really be that big a deal? Having determined my quilting method, I promptly put the issue out of my head. Now I have only a few of the 49 blocks left to piece. That means the time for quilting is almost upon me! Terrified, I revisited my previous research. I found this excellent article on Sew Mama, Sew! about the requirements for different types of batting. The article says most cotton battings (which I’d planned to use since I have leftovers from some baby quilts I made to practice) require quilting every 2-3″ because cotton shifts much more than polyester. That really doesn’t fit with the quilt blocks I made, which will be [about] 12″ finished. 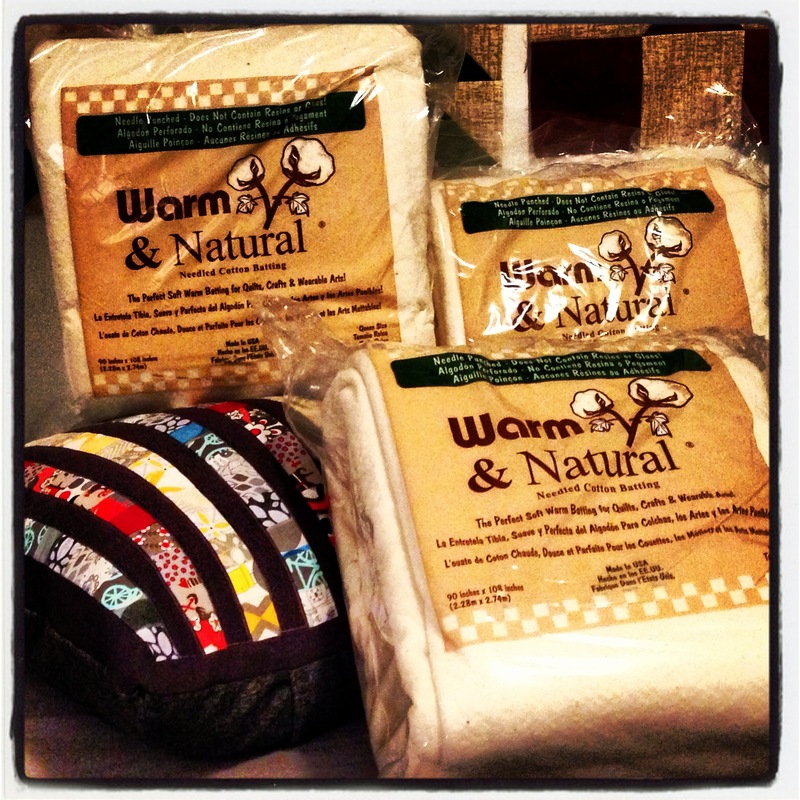 My new plan is to use a blend: the Warm & Natural brand Amy suggests in her article. It was 50% off when I went to the store last week, and it says you can go 10 whole inches (!!) between quilting lines, so I bought 3 packages of queen-size batting. I plan to make my quilt 3 layers thick for extra warmth if I can manage it in my sewing machine. (For some reason, this makes me a nut job to other quilters.) The lady behind me in line at checkout couldn’t help telling me how amazing the brand is… and about the rag quilts she’s making for her granddaughters, one of whom is picky and a teenager. I love fabric outings where everyone wants to tell you about their current projects! All that said, I wish I could use the batting I already own. My boyfriend (Johann) was funny the other day when he asked in a nonchalant way, “Oh, is this fabric new? It looks good…” He was quiet a minute, then added, “Didn’t patchwork quilts traditionally used to be made with leftover fabric from stuff like clothes?” Nuance is not normally his thing, so I found this endearing–not that it stopped me from buying 10 yards of fabric for the sashing and border. At this point, I figure I’m in so deep with fabrics and batting, I don’t want to ruin the whole thing by putting some ugly, low-thread-count sashing all over. I selected Moda’s Warm Memories in Chocolate Brown. I had an amazing afternoon looking at all of Moda’s fabric collections, past and present. In the same way I have traditionally not quilted my own things because I was scared I’d ruin the patchwork, I was worried I would ruin a piece of embroidery I’m working on when it came time to add knots. I am making a tractor for my barn quilt, and I wanted to include rivets. Too many rivets. I’ll be a regular Rosie the Riveter by the time I finish! 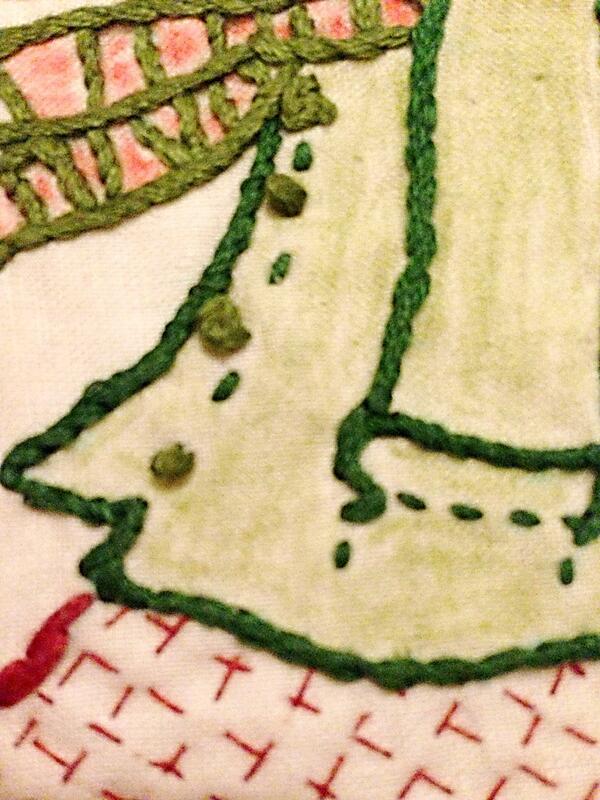 French knots aren’t my thing. When I do them, they look floppy. Below are some French knots I did on the first quilt square I completed for the sampler quilt. They’re buttons on a coat. They’re ugly and really uneven. Since the next-most-popular knot seems to be the colonial knot, I decided to try that for my tractor rivets. No practicing first, of course. (How often I have regretted this enthusiasm!) The finished product isn’t perfect, but it’s much better than the coat buttons! I had read that colonial knots consist of figure eights around the needle (with the thread) and that you need both hands. That advice was useful on both counts. I used the graphic from this website to make the knots, and I pressed the knot against the fabric while pulling the thread through to keep the knots tight. Whew! Much more even than the embroidered coat buttons, which I have chosen to consider “charming” and homemade. Another concern is the traced lines. Each block will be based on a photo from my childhood. Once I’ve finished drawing the template, I size it and trace it onto the fabric. (Wish I could freehand it, but let’s be serious.) I tried air-soluble ink, but that left me with NO LINES when I let the project sit for a few days. Not good. So I switched to water-soluble ink. I read that even water-soluble ink can dissipate in time due to humidity in the air. Since I don’t want to wash my quilt right away, even though the DMC floss I’m using is supposed to be color-safe, I am going to try to use the humidity concept to my advantage and take out the water-soluble lines with a steamer. Wish me luck! While I don’t spend much time practicing the more critical techniques like knots or quilting, I spend all the time in the world drawing and computer imaging what the finished quilt will look like. I want to see the result well before the pieces are finished. Below is an image that shows where I started with my sampler quilt (a grid on two different-sized pieces of paper where I drew every quilt block I liked that didn’t have circles or applique or otherwise look too difficult) to where I was mid-stream (closer color approximations since I didn’t have the correct colored pencils when I did the drawing version) to how I expect the finished quilt to look with sashing, using a combination of finished block photos and computer images for blocks I’m still working on. 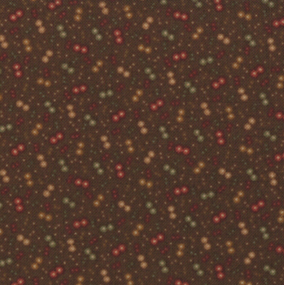 Categories: Embroidery, Quilts | Tags: backstitch, batting, batting layers, blend, chocolate brown, colonial knot, cotton, cotton/poly blend, dear jane quilt, design, embroider, embroidery, fabric, farmer's wife quilt, french knot, layers of batting, moda, patchwork, pattern, piecing, polyester, purchase, quilt, quilt as you go, quilting, Rosie the Riveter, sampler quilt, steamer, template, tracing, warm & natural, warm memories | Permalink. I use an iron on pencil on the back of my drawn pattern. Then I use water and rubbing alcohol to remove the pencil. 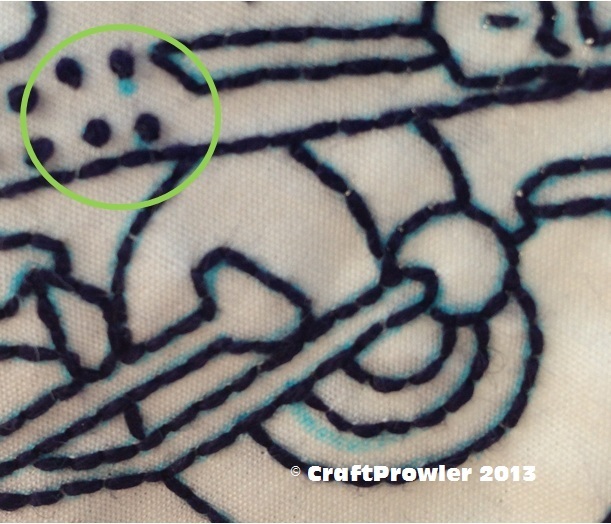 This works well on the crewel embroideries I’ve done.